I now am the proud owner of a brand new lens! I don't know why in all the preceding discussion about the cataract operation it hadn't dawned on me that my own cataract affected lens would be taken out and replaced with a completely new - artificial - one. I don't think I'd considered too carefully what exactly would happen and I didn't realise I would be able to choose what strength of lens to have. In fact under the guidance of the surgeon I chose a lens very close to the one in my other eye and my old glasses work well with this new lens and both my eyes can still read without glasses so that side of things has gone well and the surgeon said the operation itself went well. The only thing is, I'm much more conscious of the shadowy patch in the corner of my eye. I've had this all the time since the second retina re-attachment operation and have needed constant reassurance that it wasn't the start of a third detachment. Neither of the two surgeons I've been seeing have known exactly what it is but both were sure that the retina was securely fixed. Now though, this seems more extensive and is worrying me more. Anyway, I'm seeing him tomorrow and hopefully it will be that because the eye is seeing better the contrast between normal vision and this shadow area is more pronounced and that's why it's more noticeable to me. No photos of knitting because this is happening outside overlooking my favourite pho o-taking place. So photos will have to wait until the chimney is fixed. Hopefully the specialists will have some reassurances about the spot that you are seeing. Very glad to hear that the operation was a success I look forward to seeing some more of your wonderful knitting really soon! You know if you could face knitting on the scaffolding that really would class as extreme knitting. The shawl in your previous post is just gorgeous. 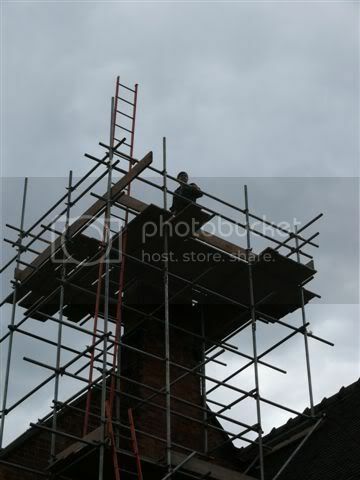 Looking forward to the chimney being fixed so we can see more!! Glad to hear that the op was successful and hope that you can have the reassurance you need from your surgeons. Looking forward to more of your inspiring knitting. I hope you are continuing to recover from the op Kathryn. It's been a long haul for you hasn't it.